The Nokia Lumia 610 is not only the most affordable Windows Phone handset by Nokia, but it also promises to keep the buttery smooth user interactions on the platform unharmed. The Lumia 610 aims to open up the smartphone world to newcomers, and good news is that it will arrive very soon in Asia. In the Philippines, for example, the phone will go on sale in the last week of April and other Asian markets like China, Hong Kong, Indonesia, Malaysia, Singapore, Taiwan and Vietnam will get it in the following weeks. When it comes to other regions, Nokia’s Lumia 610 release date is set for this quarter. The handset runs on Windows Phone 7.5 Tango and features all you’d expect of Microsoft’s platfrom, along with tethering which is new for the Lumia 900 and 610. You also get mobile Office for productivity on the go, along with Nokia’s own apps - Nokia Maps, Nokia Drive, Nokia Transport and Nokia Music. The tradeoff Nokia made to cut the price on the Lumia 610 is in the specs. The handset features an 800MHz processor and only 256MB of RAM. An NFC-enabled version of the same handset is expected to grace Orange UK in the third quarter of 2012. 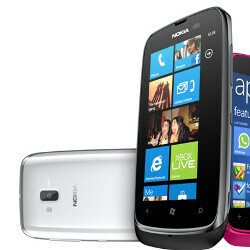 The Nokia Lumia 610 will launch in black, cyan, magenta and white, and will be priced at some $247 (189 euro) before taxes. zte wont be seeing much success, and iphone 3gs is a joke.. The price is almost equal to SE Xpera Ray, and these two devices are incomparable. Seriously, just release the Lumia 900 in Singapore already. Just go on the street or get on the subway here, pretty much everyone is on their Iphone or Samsung Galaxy II. Why even bother with the low specs phone. Phones are heavily subsidized here, and every mobile plan includes 12GB of data plan. Yes 12GB included. Not just the 1GB or 2GB you have to pay for with usa carriers or UK mobile plans. you can get better phone than this with the same price.......nokia is bulls**tting nowadays.thats why it is at loss. In the uk, you can get a lumia 710 for £130. If this phone has any chance of success, it will have to be priced lower than £100, id say £70-£80 is the sweet spot as that is the same price as the Samsung galaxy y.